Who out there has body envy? Me for one. I could totally take on Elle McPherson's physical perfection if it was up for grabs. What about body in hair envy? Yes, yes, yes!!! Give me volume, and bounce and loads of it ... that's all I've ever really wanted if the truth be known. I am the master at getting what I want in life, and getting a bit of bounce and body in my hair is no different. With a little help from my friends I can help you with your body envy too. You guessed it people, it's give away time! 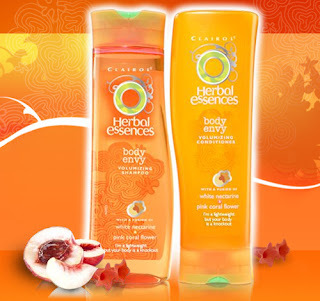 The lovely people at Clairol have given me three Herbal Essences Body Envy packs to give away (shampoo and conditioner). All you have to do to be in the draw is say "hello" to me in a different language via the comments section below, or via email or text, and I'll put your name in my sweaty ol' fake FBI hat. The competition is open to Australian residents and entries close next Wednesday 25 January at midnight. If you are one of the three lucky winners, Clairol will send out the prizes directly to you! Isn't that awesome? I think that's pretty darn great. How about Hola and Buenos Noches? I do remember some Spanish from school.